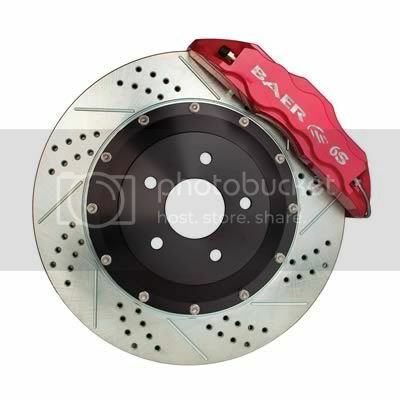 These Baer Brakes Baer Claw Extreme-Plus disc brake kits are built with durability, exceeding the demands of even the most serious enthusiasts. They include Baer 6S forged MonoBlock 6-piston calipers machined from 2618 forgings, resulting in the stiffest possible design, even at extreme operating temperatures. Next, Baer uses stainless steel, staggered bore pistons to virtually eliminate end-to-end pad taper and offer superior thermal shielding. This minimizes the effects of brake pedal fade due to brake fluid boiling. Included is a pair of 2-piece, cross-drilled, slotted brake rotors with zinc coated surfaces and a matched set of brake pads. The unique 2-piece rotors use an aluminum hat to reduce overall weight, allow for differential expansion of the rotor plates, and lower thermal transfer to the hub. Access today's most current technology and maximize braking efficiency with one of these Baer Brakes Baer Claw Extreme-Plus disc brake kits.